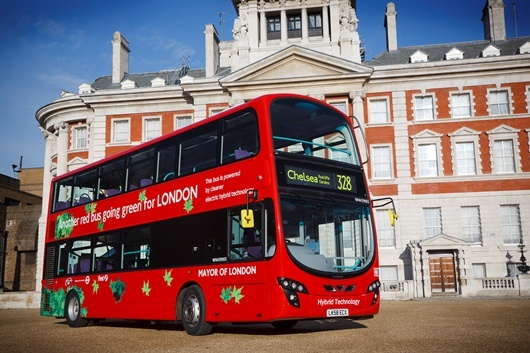 A UK consortium led by Wrightbus and including Queen’s University Belfast, Revolve Technologies and Ricardo is to carry out research in a complex project, which aims to further reduce power consumption and CO2 emissions in hybrid diesel-electric buses. The three-year “TERS” (Thermal Energy Recovery Systems) project will utilise market-leading technology to research, design and integrate pioneering thermal managing concepts into hybrid diesel-electric buses. The project aims to reduce vehicle CO2 emissions by 10 per cent through the use of waste heat recovery systems while also reducing the average power consumption of air conditioning systems by half, further improving fuel consumption. The TERS project partners have secured the necessary funding for this important work from a research and development competition managed by the government-backed Technology Strategy Board. The objective of the partners to demonstrate the opportunity for improving bus fuel consumption and reducing emissions through the capture and use of heat otherwise lost during bus operation, was seen as a potentially important step forward in public transport technology. Professor Roy Douglas, who leads the research team at Queen’s, said: “The TERS project is the latest development in the University’s longstanding research partnership with Wrightbus. In this concept, we are capturing heat energy that would normally be wasted and converting it into useful power. The challenges are huge but the potential for fuel economy improvement is also huge. The TERS Project has already created four new jobs at Queen’s University Belfast – three postgraduate and one post-doctoral position. All four graduates will be mentored throughout the development by University staff. In addition, six existing Wrightbus employees will also be heavily involved in the complex scheme, along with engineers and technical specialists from Revolve Technologies and Ricardo. Getting the first generation of devices safely up and running will be no mean feat. The consortium aims to have a production ready system available within a six-year timeframe.